Gwen Allen is a writer, researcher, and assistant professor of art history at San Francisco State University. Her book Artists’ Magazines: An Alternative Space for Art was published by MIT Press in March. David Platzker is the founder of Specific Object, “a personal venture to aggregate interesting objects in any artistic medium,” and a former director of Printed Matter, Inc. He is the curator the upcoming exhibitions “Specific Object Presents Lawrence Weiner's Printed Work from The Jean-Noël Herlin Archive,” and “Robert Barry, Closed Gallery Redux––During the exhibition the gallery will be closed,” both of which are collaborations with Susan Inglett Gallery and will open this summer. June 11, 2011 6:00 p.m. 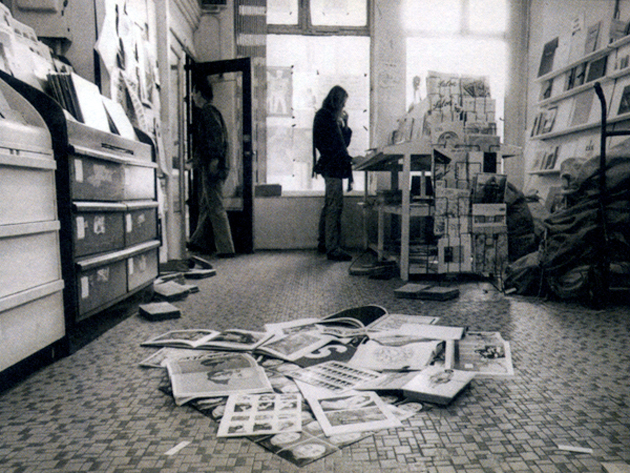 Printed Matter, Inc., at 7 Lispenard Street, circa 1980. Courtesy of Printed Matter and Sarah Longacre. Triple Canopy and Printed Matter, Inc. present Volume Number, a discussion of the past, present, and future of artists’ publications. The conversation will take as its starting point Gwen Allen’s recent book Artists' Magazines: An Alternative Space for Art (MIT Press), which surveys American and European artists’ publications from the 1960s to the 1980s. Allen will give a brief presentation of this history, which will be followed by a discussion of its relationship with a variety of contemporary publishing projects, from multimedia journals to generative archives to e-books. Participants include Paul Chan (Badlands Unlimited), Angie Keefer (The Serving Library), Matt Keegan (==), David Platzker (Specific Object), and Colby Chamberlain (Triple Canopy), who will moderate. Related books and other materials by the participants will be available for purchase at the event. Volume Number will be preceded by a book launch for Allen at Printed Matter, Inc., 195 Tenth Avenue, on Friday, June 10, 6—8 p.m. Artists' Magazines: An Alternative Space for Art is also available online here. Special thanks to Dia Art Foundation and Karen Kelly.